You can unlock countless mysteries of the world by grasping two key pieces of knowledge. The history of the world changing from a handful of giant empires to nearly two hundred nation states in the 20th century, and coming to grips with the realities of an absence of competent national leaders. That’s it. Jaws drop when people hear that in 1945 there were 57 countries, but in 2017 there were 193. Most grasp the significance of 1945 as the year WWII ended, but not as the year the Era of Empire ended and the Era of Nation States began. Vast empires conquering and subjugating populations seems to be part of a history where gladiators faced starving tigers, not something offering simple explanations to so many of today’s headlines related to Islamic unrest, obstinate China, Russian intransigence, European xenophobia, and American meddling. This though is the reality. It wasn’t long ago that Islamic empires were riding roughshod over Christian empires. Then in the 20th century they were all gone, and Christian empires were mentoring and protecting Muslim lands. That was humiliating. China cut a daunting figure on the world stage until it suffered a century of humiliation (1839-1949) compliments of the Japanese, Russians, Europeans, and Americans. The Russian Empire shared the global limelight until the 20th century. Then it re-emerged stronger as the Soviet superpower challenging the western world for supremacy. Then it lost the cold war in 1991 to western powers. That was mortifying. The United States had been a puny colony when Russia was a vast empire. These were all uber outcomes of the world’s greatest competition: a competition for global supremacy and it took place during the Era of Empire (1453-1945). At first the motivator was religious supremacy but then it became pure and simple, global supremacy. First the Islamic and Chinese empires were on top. The Russian latecomers pulled ahead of both of these empires. But, in the end the victors were the European empires. Europeans and their descendants have ended up governing half the nations in the world, and Christians formed a global religious majority. This competition for empire clearly changed the global pecking order, at least for now, but it also forever changed the world. Instead of thousands of homogenous ethno-linguistic groups, the world was filled with diverse populations along with its natural parallel, discrimination. Instead of thousands of languages creating a global tower of babel, nine predominant languages connected vast populations. Instead of thousand of indigenous religions, most of the world followed one of four organized religions. The competition ended up creating a world that had significant bonds for cohesion. But it also created some jumbo areas for division. English speakers in the United Kingdom have an easy time communicating with Australians, but English is gibberish to a Russian. Organized religions created shared values among massive groups of followers, but between Buddhists and Christians and Hindus and Muslims, and even some religious sects beliefs could conflict. The empires instigated massive flows of immigrants across continents. While this created cross-border ties with their home polities it also added diversity in their new homes that fuelled discrimination. The empires as catalysts for cohesion and/or division are important, but so is the reality of empires as sparing no restraint to conquer and repress populations. Nowhere was this more aptly illustrated than in WWI and WWII. The Chinese, European, Islamic, and Russian empires were simultaneously battling to defend or expand their empires. So insane was the depths that empires would undergo to expand or defend their rule it became the catalyst for ending the competition and the era. There was a real fear if the competition for empire did not end it would destroy the world. At the end of WWII world powers agreed that the global zeitgeist of giant imperial powers annexing large tracts of land and subjugating diverse populations had to pass. In its place would be nearly two hundred smaller sovereign nations. Ready or not populations flocked to independence. Everyone wanted to be free of foreign subjugation. The declarations of independence were joyous events as the yoke of subjugated rule was finally over. But, the euphoria was short lived. People had been so focused on dispensing with the imperialists and taking charge they discounted the reality that they were wholly unprepared. The empires after all were not in the business of preparing their colonies for independence. New national leaders faced the enormous complexities of nation building, including some inherited from empire, like diverse and discriminated populations. There was no shortage of men stepping up to the plate to be national rulers. There were so many wannabes, coups were as common as elections. Many new national leaders arrived in office and then refused to leave outside a coup or a coffin. Instead of building infrastructure and institutions, many seemed to specialize in using national treasuries like personal piggy banks to enrich their families and other supporters. Unskilled and misguided leaders created extraordinary challenges, but nation building was further complicated by postscripts of empire, many taking the form of neo-imperial empires. Instead of empires engaging in physical conquests neo-imperial empires vied for ideological acolytes. During the cold war (1947-1991) the neo-imperial first world’s pro-democracy nations engaged in proxy wars with the neo-imperial second world’s advocates for global communism. In 1979 another neo-imperial proxy war broke out for supremacy of Islam. Neo-imperial Shia Iran ignited a proxy war with neo-imperial Sunni Saudi Arabia. This war was a complete déjà vu Era of Empire moment. Between 1945 and 1991 an estimated 20 million people died from cold war-related conflicts, most from new nations and beginning in 1979 death tolls from Saudi and Iranian militant proxy wars began their ascent. The damage to nation building from these neo-imperial proxy wars cannot be fully accounted for, and nations all over the world suffered setbacks. When the cold war ended in 1991 pundits imagined that finally there would be peace in the world. Finally the world would be ideologically unified behind democracy. Finally, nations could focus on nation building. These though were the naive thoughts of people unfamiliar with the history of empires. The world has never been united on democracy, equal fundamental freedoms like freedom of religion, or even the replacement of empires by nation states. But, the competition for empire had ended and for very good reasons. There could be no return to empire. There was though a giant problem. The competition created too many disagreeable outcomes, including a new world order being defined by western powers – the victors in the competition. There were scores to settle, like the humiliation of losing. The post cold war period ended up becoming a period of neo-imperial-empire score settling and it was the west versus the rest. Stateless Islamic militant groups, many spawned from Saudi-Iran proxy wars saw the end of the cold war as an opportunity to settle long festering wounds of being beaten by the Christian west, and being subjected to western values like secularity and the notion of nation states. There were new bids for Islamic empire. The Russian Empire died in 1917 but in 1922 it re-emerged as the Soviet Union on a comeback mission. Their return to glory was predicated on demonstrating that communism was a superior political and economic system to democracy and capitalism. But the demonstration failed. The Russian Empire’s demise was rooted in substandard economic outcomes, and now so was the Soviet Union’s. The Soviet loss fuelled the Russian desire for a return to the world stage. They would begin by re-exerting their influence over former Soviet and Russian empire lands, and once again taking aim at the western world. This comeback kid redux was neo-imperial Russia. The Chinese have never taken the Century of Humiliation lightly. Mao Zedong’s China was to be China’s re-emergence as a superpower, but when Mao died China counted among the seriously backward countries. His successors tired a different approach. They implemented economic reforms that were inconsistent with the Maoist playbook. These reforms and new opportunities in a post cold war world gave China its comeback to the world stage. It was soon evident that this was neo-imperial China. European nations had actually begun preparing for their neo-imperial position shortly after WWII. They knew that the end of empire would have dramatic economic consequences, like the loss of captive markets and suppliers. The European Union was neo-imperial Europe and its implementation in 1993 was timely. The United States had been building its strength as a neo-imperial power since WWI. Its presence among the neo-imperial successors to the Chinese, European, Islamic, and Russia empires was though really quite extraordinary. The United States was a puny colony when the empires ruled the world. But they had become an unparalleled colonial success story, and by the time the post cold war period arrived the United States was feared and revered at least as much as any neo-imperial power. The influence of these neo-imperial empires on other sovereigns has been impressive, but it has also been very different from that of imperial empires; they have not been ruling other nations. This has been the job of national leaders. That would be the good news and the bad news. Many national leaders remained too misguided or under-skilled for leading nations. Their collective track records remained abysmal. Some continue pointing at empire aftermaths and postscripts, but in an era of sovereign nations the buck stops with a nation’s leaders. The Era of Nation States tells the tale of failures and successes of under-skilled or misguided national leaders, and the occasional leader of substance. It tells the tale of why some nations are rich and others poor, why discrimination persists around the world, and why religious conflict has re-emerged. 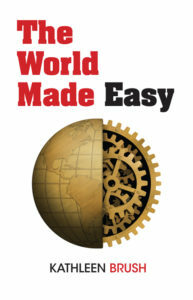 The World Made Easy takes the reader on a journey from the Era of Empire through the Era of Nation States. The journey is carried out in a series of five books. Book one explores the extraordinary impacts of the Chinese, European, Islamic and Russian empires competing for global supremacy for five hundred years, and then the effects of empire postscripts. In section two it shifts to segmenting the world into twelve regions and summarizes: how the Era of Empire unwound, the aftermaths of empire, and the trials and tribulations of transitioning from giant empires to twelve regions of nearly two hundred nation states. Book two focuses on the Era of Nation States, an era when a map of the world started with 57 nations in 1945 and ended with twelve regions and 193 nations in 2017. On average three new nations rolled out every year between 1945 and 1991 and most were wholly unprepared for becoming an independent sovereign. New national leaders had their work cut out for them. They had to build nations from the ground up. There was infrastructure and institutions to build in order to create self-sustaining economies and governments. This often had to be done with diverse populations with histories of discrimination and in an environment of empire postscripts, like neo-imperial proxy wars. It was a tall order for a national leader suitably competent but most were not. Books three through five takes a closer look at some powerful drivers of national development: discrimination, economic development, and patriarchy. The empires shifted the world from homogenous to heterogeneous polities. The empires turned social ladders upside down: where they conquered, their people rose to the top of the ladder and indigenous populations fell to the bottom. In the Era of Nation States it was intended that the notion of superior and inferior population was to end. New national leaders were supposed to be committed to equality, and consequently responsible for ending discrimination. Instead they often exacerbated it. Christians and Jews became the bogeymen in the Muslim-dominated Middle East. Chinese in a several locations faced blatant discrimination and even pogroms. Whites saw departure from sub-Saharan Africa as a sane decision. Many national leaders saw discriminatory practices as valuable, just like empire. The origins and evolution of diversity and discrimination around the world is the subject of the third book. Book four takes place almost exclusively in the Era of Nation States and it looks at why some nations are poor and others rich. For sure, the aftermaths and postscript of empire have created additional challenges but a nation’s status as rich or poor falls squarely on the decisions taken by its national leaders. Will investments be made in infrastructure and institutions like education, or will national monies enrich supporters? Will national leaders seek peace or war? Collaboration or confrontation with other nations? Will they unify or divide their nations? Decisions like these have had great import on which nations are rich and poor. The empires didn’t invent patriarchy but they perpetuated it. It was common for rulers to rely on sacred texts to rule and this made discrimination against women God’s will. The Confucian social order was so important to the Chinese Empire’s rule it institutionalized gender discrimination. Like other forms of discrimination gender discrimination was meant to end in the Era of Nation States because this was to be an era where fundamental freedoms applied to all equally. But patriarchy stayed alive and well. The greatest progress for women closing the gender gap has occurred in the subset of European empire successor states called western nations. Gender inequality has remained strongest in the successor states of the Chinese, Russian, and Islamic empires, but while women in the Russian and Chinese successor states have been making noticeable progress closing the gender gap, many in Islamic successor states have not. The continuation of gender inequality is often illustrated with pay gaps and promotions, and even an inability for women to drive. It is rarely correlated with domestic violence, even though the two are closely correlated and this is its most horrifying outcome. There are no nations with gender equality and there are no nations that do not have a problem with domestic violence. There are only variations in the levels and these are tightly correlated to the degree of gender inequality. There are still nations where women continue to live at the mercy of men that see them as public whores and punching bags and this is where the gender gap is gaping. Book five explores: the history of patriarchy, and why its place in the world has remained so secure; it examines the current strength of patriarchy in the twelve regions of the world; how patriarchy influences women’s opportunities and safety; and why and how it can change. Travelling the journey from Era of Empire to Era of Nation States promises a foundation of knowledge that will allow the reader to make sense of seemingly incomprehensible events. For example: Why do Muslims celebrate the senseless murder of innocent Christians? What possesses Russia to create havoc in democratic nations? Why has China annexed the islands of other nations in clear violation of international law? Why are French forces commonly deployed to end mayhem in sub-Saharan Africa? Why has the United States so often interfered into the affairs of sovereign nations? A sovereign by definition has ultimate power between its recognized borders. Western nations include countries from Western Europe, Canada, the United States, Australia, New Zealand and Israel.